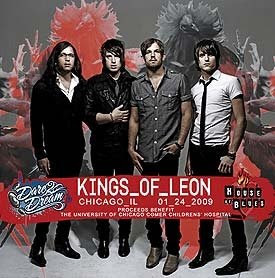 Kings of Leon are set to play a show at House of Blues Chicago on Saturday, January 24 to benefit pediatric cancer research at the University of Chicago Comer Children's Hospital, and are giving bands the chance to score the opening slot. Tickets to the show, dubbed "Dare 2 Dream," go on sale Saturday, November 15 at 10 a.m. and cost $150. All proceeds benefit the cause. Think it would be sweet to open for the Kings? The event's organizer, Platform One Entertainment, is giving one band or artist the chance. Artists can enter the contest for $15 at Sonicbids.com by December 5. Platform One and Kings of Leon will then narrow the entries down to five, and an online vote will determine the winner, who will have the opportunity to perform at the show in front of local and national media as well as music industry VIPs. The winner will also receive $1,000 for travel and hotel expenses.